INSIGHT: Adult dogs that get over 60 minutes of avg. 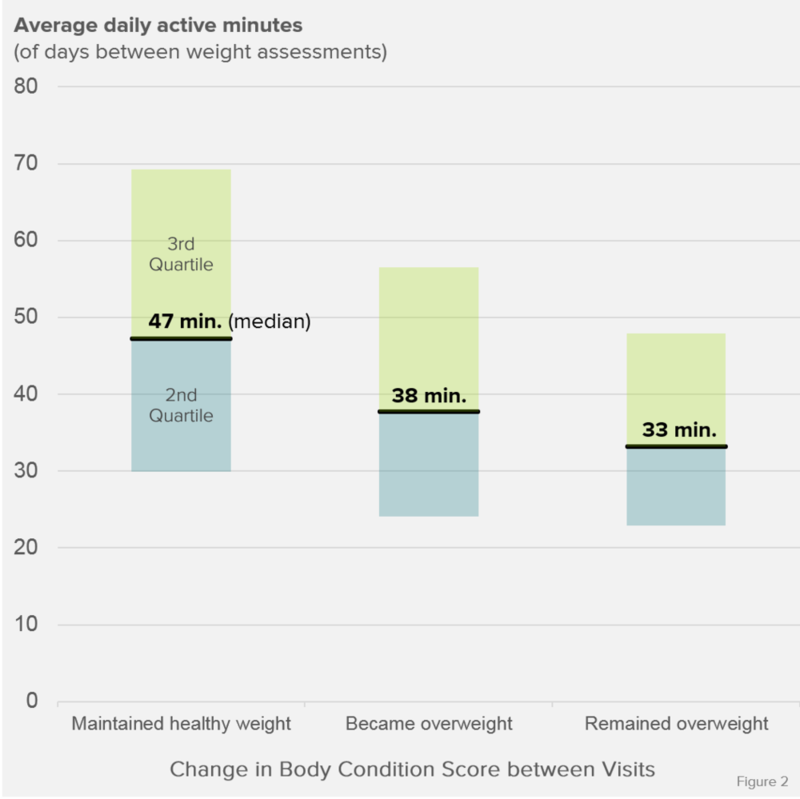 daily activity are less than half as likely to be overweight or obese. WHY IT MATTERS: Physical inactivity is linked to obesity in dogs as well as humans. Inactivity and weight gain are a vicious cycle - decreased movement results in lower calorie burn and resting metabolic rate, which can lead to weight gain. Excess weight makes movement more challenging and places additional strain on the joints, resulting in decreased movement. INSIGHT: Dogs that became overweight averaged 20% fewer daily active minutes than those that maintained a healthy weight. WHY IT MATTERS: You can reduce your dog's risk of becoming overweight (and the bad health outcomes associated with it) by maintaining higher activity levels. While proper nutrition is the biggest factor in avoiding obesity (it is a lot easier to measure food portions than block out an additional hour of dog walking every day), our research shows a clear link between inactivity and the likelihood that a healthy weight dog becomes overweight. INSIGHT: Inactive breeds have a higher prevalence of obesity, but there are many exceptions. WHY IT MATTERS: What is needed to stay healthy will vary by breed, and activity is only part of the equation. Some breeds are more susceptible to unhealthy weight gain and obesity. It appears some variation in obesity prevalence may be related to a breed's inclination to be active, or even owners' self-fulfilling perception of how active that breed should be. However, differences in metabolic rates, eating habits (e.g. the "vacuum" labrador), and other physiological and genetic variation among breeds plays a huge role in the risk factors for obesity. Figure 1: Reflects % Pet Insight dogs that are currently have a diagnosis of overweight or obese in their medical record. Includes dogs that logged at least 30 days of Whistle data. Adult (1-7 yr.) dogs N = 15,779. Adult Golden & Labrador Retreivers includes dogs with owner-reported breed as Golden Retreiver, Labrador Retriever, Golden Retriever Mix, and Labrador Retriever Mix. N = 2,342. Adult Chihuahuas includes includes dogs with owner-reported breed as Chihuahua or Chihuahua Mix. N = 754. Figure 2: Includes dogs that logged at least 30 Whistle Days and have at least two visits to Banfield Pet Hospital in which a body condition score was assessed. "Maintained healthy weight" group consisted of dogs that maintained a BCS of 3 (on 5-point scale) between visits - N = 1,137. "Became overweight" group consisted of dogs that went from BCS of 3 to BCS of 4 or 5 - N = 279. "Remained overweight" group consisted of dogs that maintained a 4 or 5 Body Condition Score between visits - N = 216. Figure 3: Depicts subset of breeds with at least 50 qualifying dogs that were selected due to high popularity, notable obesity rates (high and low), and/or notable activity levels (high and low). 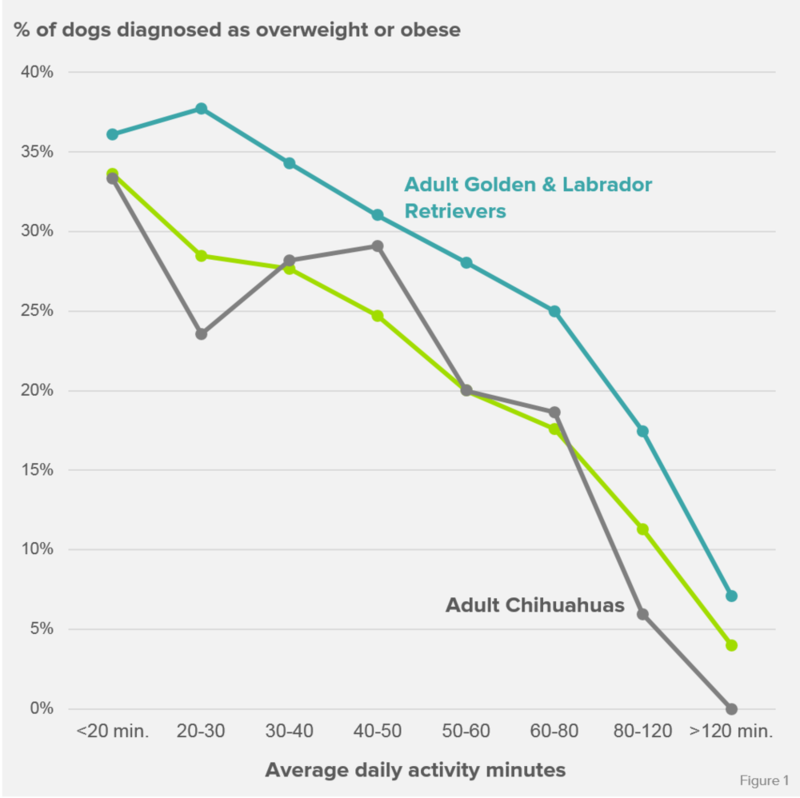 Obesity prevalence reflects percentage of Pet Insight dogs that are currently have a diagnosis of overweight or obese in their medical record. Includes adult dogs that logged at least 30 days of Whistle data.